Shantanu Tushar continued his QML browser experiment some more, and posted an update. He’s gone ahead and bought a Jolla phone which does QML too, with the intention of proving out the browser idea on that, which would be awesome. I’m going to wait a couple of months for the Ubuntu Touch mobile phone which also do QML natively. QML on iOS and Android. Neither of these platforms supports QML or the underpinning technology Qt out of the box. QML & Qt can work on top of Cocoa Touch and Androids UI frameworks already. You just need to include bits of Qt and the QML interpreter as part of the binary distribution. What would be nicer is if a QML app could ship to the iOS platform on it’s own, and stipulate a list of library or framework dependencies, which would also need to be downloaded and installed. At least, at a certain level of granularity. That way, organizations that want to use QML would be able to slim then distributions some, as were talking of tens of megabytes here. Of course Apple wouldn’t have much interest in supporting that model, while they feel (for a certain demographic) that they own the way apps are developed, and don’t have to facilitate a code-sharing vision. If Android and iOS are the market leaders, there’s are 3rd, 4th, 5th place platforms jockeying for position. That Jolla and the Ubuntu Mobile platforms optionally used a shared UI framework, means they can share code, and that no doubt lifts their viability. 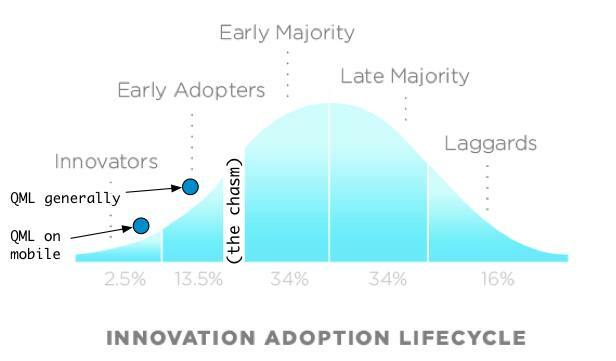 The chasm is about the technology adoption lifecycle (the art above is from there), and a Geoffery Moore series of books that explore whether there’s a gap for new technologies, that manifests itself as a problematic transition from “early adopter” to “early majority” and a gradually increasing usage in the industry. Sometimes it takes superlatives (“5x more productive that Java”), table thumping, and a bunch of speakers on a tour to nudge a technology over the chasm and towards wider patronage.